I went to pick him up, and he was obviously in pain. He refused to move his arm at all and had tear streaks down his face. We went to the urgent care clinic. They did an x-ray. 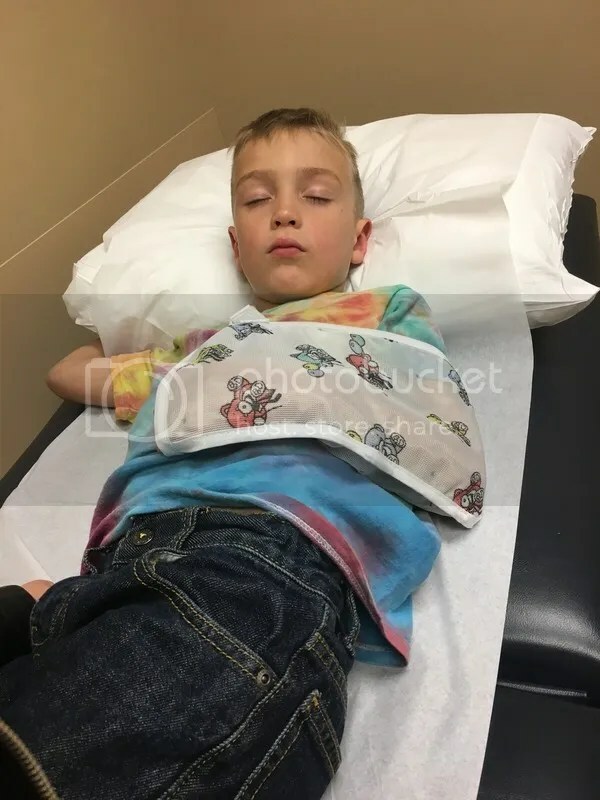 It came back as “inconclusive.” There wasn’t an obvious break, but they also couldn’t really tell with the growth plates in his elbow. We were refered to Fort Wayne Orthopedics. I’m really thinking that I need my own parking space near the building and maybe a wing of the office named after me. The x-rays were reviewed. They also didn’t see a break, but really couldn’t tell. Rather than put Navy through the stress of an MRI, they put a splint (kinda like a half-cast…hard on the bottom wrapped in an ace bandage). We go back in a week and a half to see if he feels better or have his elbow x-rayed again.